Dr. Neil DeGrasse Tyson, director of the Hayden Planetarium and host of the recent Cosmos reboot, would like to know within 50 years if there’s any life in our backyard—Mars, Europa, Enceladus, Titan, etc. It’s an ambitious goal, certainly, but it’s one that’s seconded by the foremost space agencies in the world, and is a major cornerstone of NASA’s astrobiology program. And there’s every reason to be optimistic that Dr. Tyson’s hopes may be realized within the time frame he’s set. There’s been a frenetic spate of intensive astrobiological research throughout the solar system in recent years; and the pace of activity is only set to increase as time goes on. 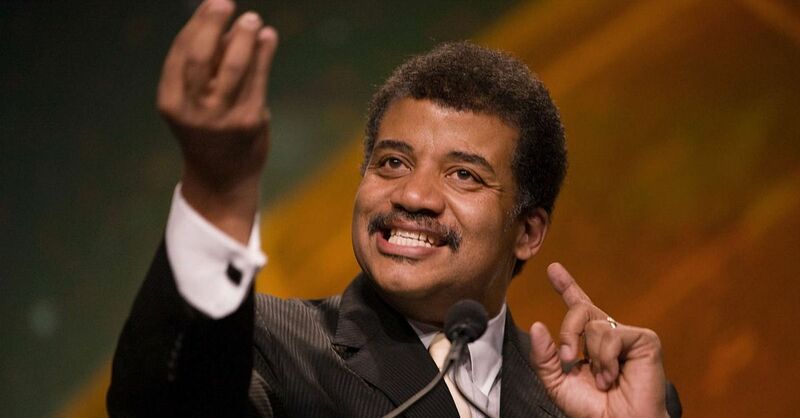 Dr. Neil DeGrasse Tyson, expounding on the wonders of the universe and loving every minute of it. There are many robotic craft operating on (or in) orbit about Mars, the prime focus in the search for extraterrestrial life within our solar system; the Curiosity rover expands our knowledge of Martian geology and history daily, and the twin rovers Spirit and Opportunity have been exploring the Red Planet for over 12 years. Elsewhere, plans are in the offing for missions to explore whatever might lie beneath the shifting ice-plates of Jupiter’s moon Europa, or whatever sub-surface ocean feeds the ice-geysers of Saturn’s moon Enceladus; and Saturn’s other intriguing moon, the smog-shrouded Titan, has long been a target for astrobiologists, with its weird weather, geology, and “hydrologic cycle” based on methane and ethane. But for Dr. Tyson, the pursuit of alien life—and the discovery of a truly independent lineage of living things within our solar system—is one of the most important goals of modern science, and for a host of reasons. Right now, our understanding of life is extremely limited, and that is because we have only one sample to study—our own, terrestrial life. We may marvel at the enormous diversity life has attained, in the multitude of permutations earthly life has expressed throughout the vast gulfs of geological time, and in the many different environments it has adapted to thrive in. But it all has one thing in common—a single origin in deep time, and the use of nucleic acids to mediate replication and transmit heredity. But if we could find a type of life within our solar system that was not “encoded”—that is, did not use DNA or RNA or any other macromolecule to register biological information—then we could be sure that this life possessed “an entire other genesis,” completely independent of terrestrial life. In other words, life as we currently understand it is an anomaly, and almost impossible to truly define for lack of sufficient samples. Our definition of life amounts to…well, you know, things that are alive, and stuff. But such a vague and nebulous answer doesn’t cut it with Dr. Tyson. He wants something scientifically rigorous and exact. But he makes an important point. Perhaps, in the next fifty years, all our efforts will pay off, and we’ll finally discover—whether in a Martian crater, or in a Europan ocean, or in a frigid Titanian lake of hydrocarbons—one of Dr. Tyson’s extraterrestrial samples. And then we can get down to the business of figuring out what life really is. Check out everything Dr. Neil DeGrasse Tyson has to say about the subject in this video from Tech Insider.